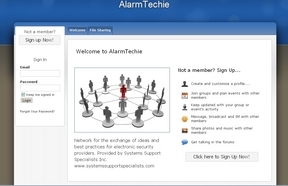 Systems Support Specialists' AlarmTechie website is an interactive meeting spot for the electronic security professional. The site is open to dealers, installers, central stations, and technicians free of charge. Finally the alarm professional has a place to freely exchange ideas and knowledge. Get the latest news, mentor, and learn about the ever-changing security industry. Here you are encouraged to post information about coming events. Share photos about job, brag a little, or ask for some help. Copyright © 2011 Systems Support Specialists Inc.. All rights reserved.